Art exhibition: Herstory at Touchstones Rochdale ft. Sam Taylor-Johnson & Barbara Kruger. New visual arts show Herstory brings together 33 pieces by female practitioners as part of Touchstone’s ongoing Contemporary Forward programme of exhibitions and events. Entitled Herstory: Women Artists from the Collection of Patrizia Sandretto Re Rebaudengo, the works make up part of the 1,500-strong hangings and sculptures at her eponymous Turin-based Fondazione (and, from next year, the Fundación Sandretto Re Rebaudengo in Madrid). One of Europe’s most daring patrons of contemporary art, supercollector Patrizia has been championing women artists since 1992, amassing the likes of Young British Artists Sarah Lucas and Gillian Wearing, and, from across the Pond, Cindy Sherman and Catherine Opie. 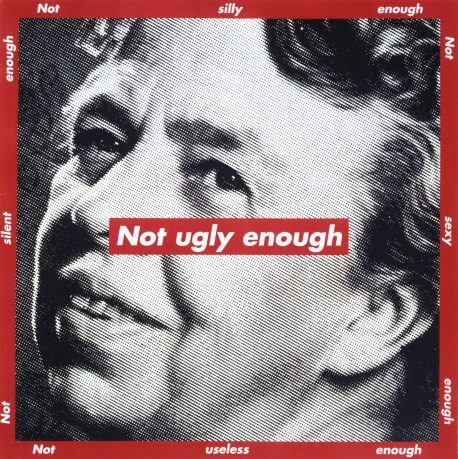 This show celebrates inspirational women (particularly as Patrizia Sandretto Re Rebaudengo is still one of only a handful of women in the male-dominated environment of art collecting and patronage) and reflects Rochdale’s radical history by showcasing challenging pieces by, among others, Sam Taylor-Johnson, Barbara Kruger (work pictured), Sherrie Levine and Mona Hatoum alongside items from the gallery’s own collection.